Not strictly monochrome, I know, but it’s what I felt moved to submit this week. Normally this would be an image of brilliant hues of yellow and green and brown. It was fun to see what would happen if I toned it down. Looks like the Brown-Eyed Susans “pop” in the image. What do you think? 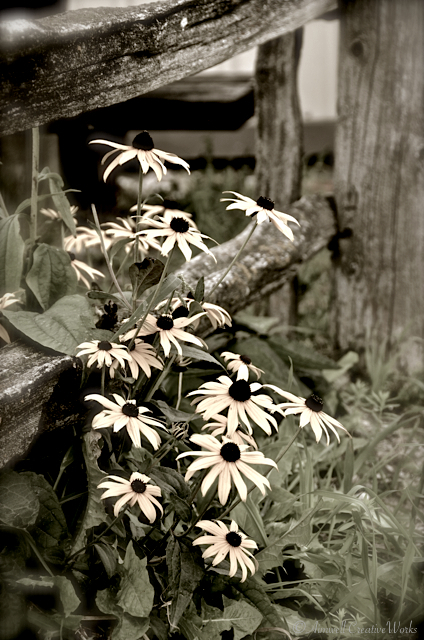 This entry was posted in Garden, Nature, Photography and tagged Aimwell CreativeWorks, black and white, brown-eyed susans, country, Dorothy Chiotti, flowers, Leanne Cole, monochrome, Photography. Bookmark the permalink. Maybe there should be a new term to describe this type of photo–‘Subduetone’ It is beautiful, and yes, the flowers definitely pop!